What to have complete control over your competitions? Then this plugin is for you. The Top 10 Voting System V.2 is a hugely updated version of the current Top 10 plugin on my site. Which i will now be giving away for free. If you have already purchased the previous plugin then you will have received an email with a coupon code of the same price as the previous plugin. In a nutshell it is a button that is placed on your posts or pages and users can then vote for these posts/pages. Its a great way to interact with you fans and followers as well as bringing in more new users. 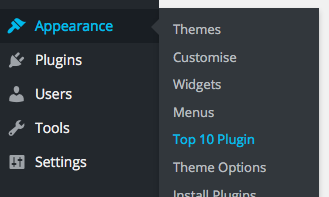 There are lots of options to choose from to develop and modify the Top 10 plugin to suit your website. Once clicked, the stylish new page opens up to your control panel. Here is where the magic happens. You can change a variety of options to suit your website, for Example the button that is displayed. You can also select the color scheme that you wish, there are three options. Color for the Number 1 (Make your number 1 the winner) Color for the even numbers and color for the odd numbers (a nice way to see the differences). Lastly you can choose where to show the buttons (on each page or on each post) or you can simply paste the code “<?php $top10 = new Top10(); $top10->top10_manual_frontend( get_the_ID() ); ?>” into the php code. There are lots more options you can choose from, including which categories to show up in the top 10 as well as showing top 100 or not. And with constant work going into V.2 it will keep being updated in the future. Showcase previous weeks/months Top 10. Pop up “thank you for voting” . Show button at the top or bottom of the post/page. A full list of codes are included in the plugin, if you haven’t received them, please contact me asap!